Micro Pressure returns with serving #7 of EDM Synth Shots featuring a freshly baked collection of 500 synth goodies ready for on the spot track spiciness. Similar to the way you've been indulged in the past, this new collection is no different and offers a wide range of chords, stabs, wobble infused and simple bass cuts, pianos and various synth hits. All of these massive sounds come with a humble price tag. In this 7th installment, HY2ROGEN has implemented even more wobble and electro bass shots but not without the usual bigroom stabs, trap-style hookable synths along with bass & groove house tools. 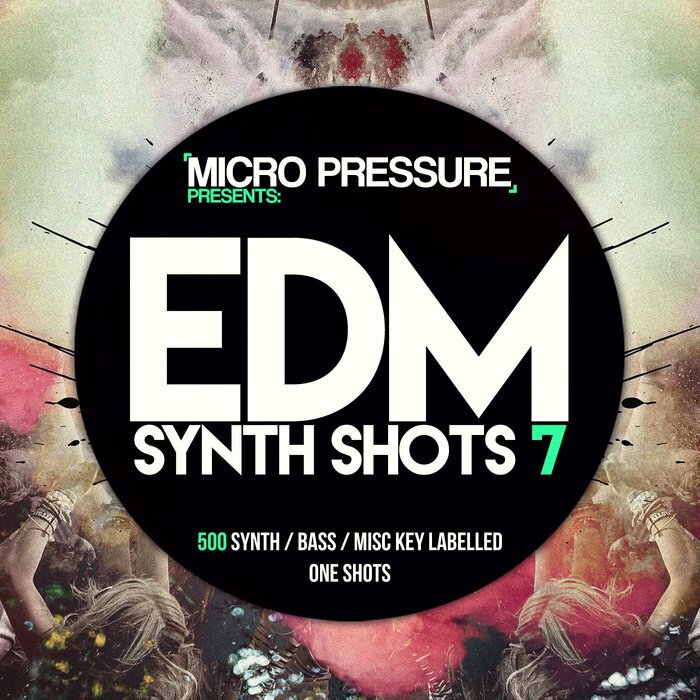 The pack contains 500 pure edm key labelled synth shots and bass cuts perfect for adding to the main hook or simply building a new one. For wobble/trap style enthusiasts, the synth cuts can spark instant inspiration for serious main hooks. LFOed bass cuts (128bpm), piano rockers, main lead strips, hookable crazy synths, ready-to-be-reverbed plucks and even a few flutes here and there are included in this package. The 500 synth shots/bass cuts are delivered as WAV singles along with 92 sampler patches for EXS24, Kontakt, NNXT and Halion software samplers for easy access and usage within your workflow. In the Sampler Patches folder you will find the synth shots both random and organized in keys for easier access and grouping. (0 to 500 and Synth Shots F, Synth Shots G, Synth Shots X). Remember to stack some of these synth shots to make the most out of them. Create complextro and dubstep type riffs by playing different sounds in the same key and create interesting drops for your future compositions. Please Note: The demo includes sounds not included in the pack (drums, effects and vocal loops).